Something about Summer has us grilling a ton and relying on quick and easy everything! 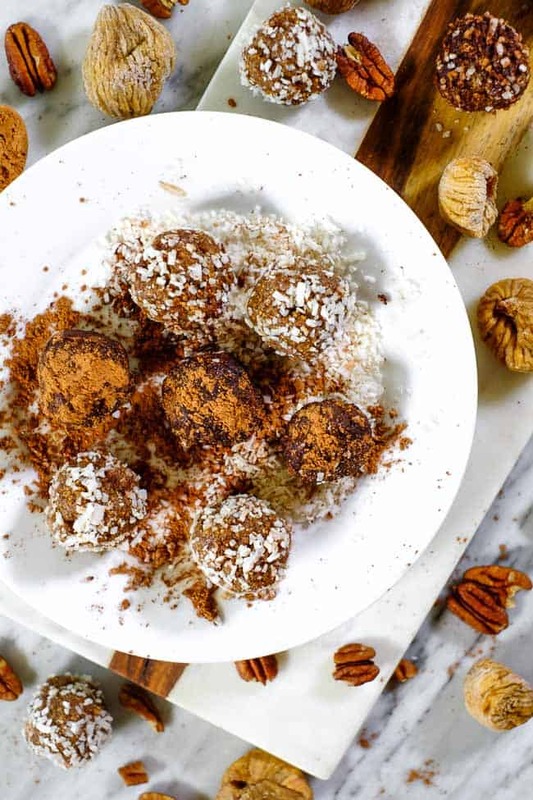 These fig and date bliss balls are a great grab-and-go snack you can easily meal prep over the weekend and have on hand for healthy snacks during the week! 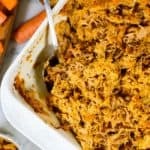 They are both Paleo and Whole30 friendly and will have you feeling nostalgic about your childhood and enjoying these healthier Fig Newton flavors. 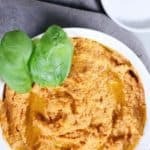 Disclaimer: We partnered with Paleovalley to bring you this post. We only work with companies and brands we truly believe in and use ourselves. Therefore, all opinions and recipes are entirely our own. Thank you for supporting Real Simple Good and our partners. 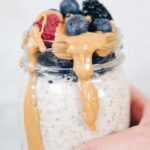 Snacking is hard because it can easily lead to succumbing to convenience, and I think we all know that often times convenience ends up being a less healthy option than what we would go for if we had planned well. 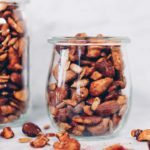 So…for us, the best way to snack healthy is to meal prep something that is satisfying, nourishing and gives us a little pick-me-up. 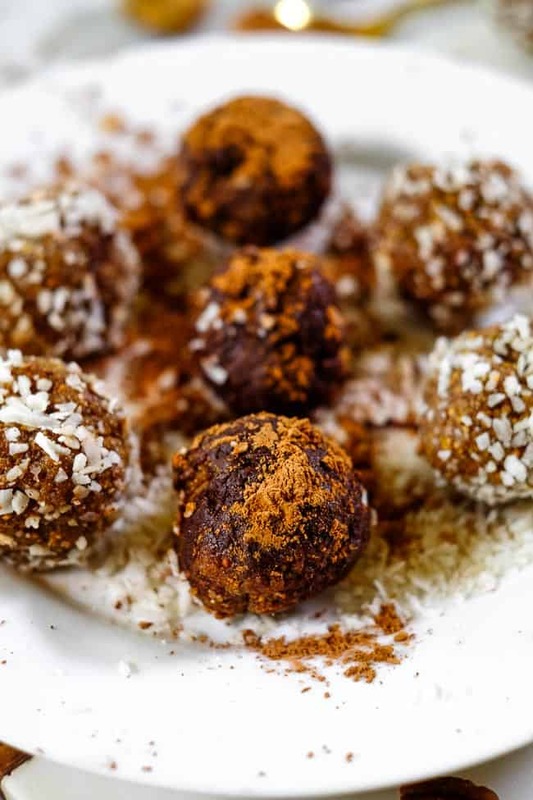 These fig and date bliss balls are exactly that! 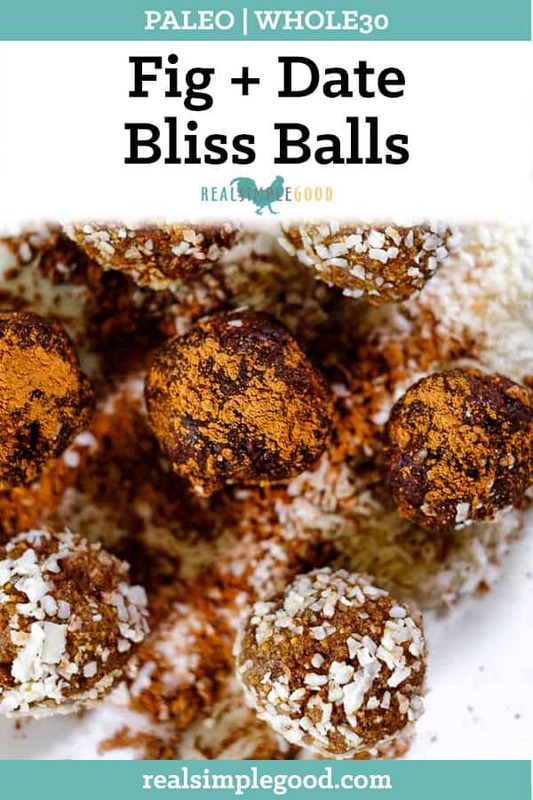 They’re easy to make, and when the most convenient option is a snack we have already made, it wins every time! Take unhealthy options off the table by prepping ahead of time so when hunger strikes, you already have a game plan! 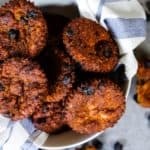 These fig and date bliss balls are super easy to make. You just toss everything in a food processor and let the machine do the work. 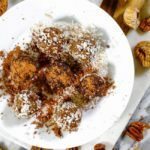 It takes a few minutes to break down all of the ingredients and get to the texture that allows you to roll them into balls, but you can have this snack prepped in 10 minutes or less! Then, you are all set and a healthy option is ready to go in the fridge! Pack a ball or two with you as you head out the door! Made with 100% grass-fed and finished beef bones, filtered water and no additives or fillers! 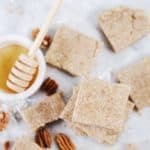 Made from bones not just the skin or hide – typically collagen protein, while still beneficial, is sourced from the skin of the animal, not its bones. When collagen is sourced from the animal’s skin, we miss out on all of the extra nutrients and restorative benefits of the bones. The bones are where it’s at! No pesticides – Paleovalley verifies with third-party lab tests for over 40 different pesticides and herbicides which have come back negative. 15 grams of protein per serving! Blend it into your morning coffee, matcha, tea, smoothies, etc. 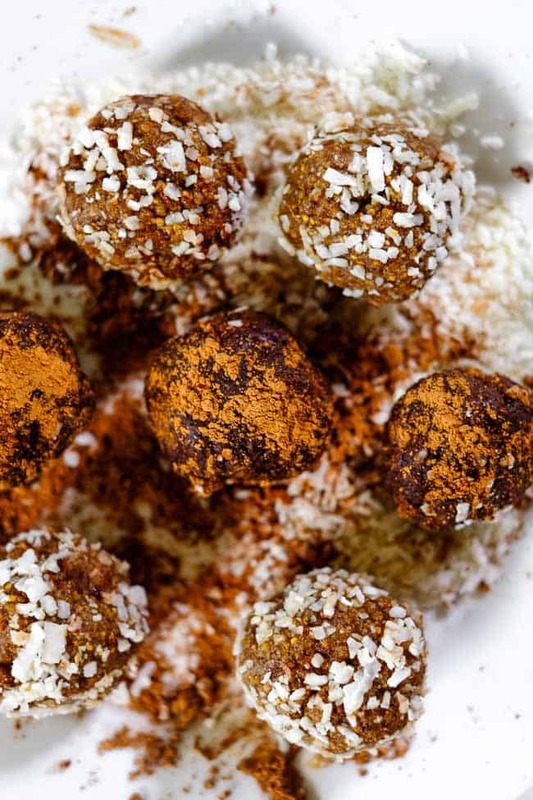 or add it to your cooking like these fig and date bliss balls. By now you must be itching to get your hands on some of this Paleovalley 100% Grass-Fed Bone Broth, right!?! Paleovalley has offered our readers a special 20% off discount for a limited time (August 1-15, 2018), so jump on over to their site and order some today! Just use the code realsimplegood at checkout to get 20% off of your ENTIRE order. Hurry on over, and stock up today to get some delicious, protein filled healthy bone broth collagen, on-the-go snacks like their beef and turkey sticks and supplements too! 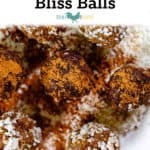 Get your meal prep on this coming weekend and make these fig and date bliss balls with Paleovalley 100% Grass-Fed Bone Broth protein powder. 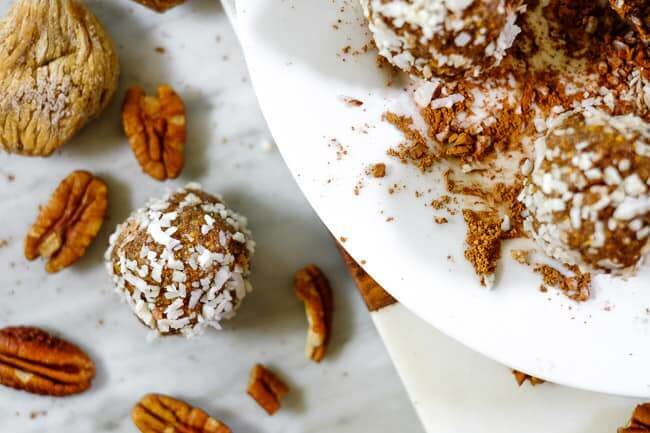 You’ll appreciate having a healthy snack option already made and ready to go during the work week! Leave a comment below to let us know what you think and how it goes! Also, take a photo and tag us on Instagram @realsimplegood! We love seeing your creations, and make sure to give us a follow on Instagram if you don’t already so we can stay connected! 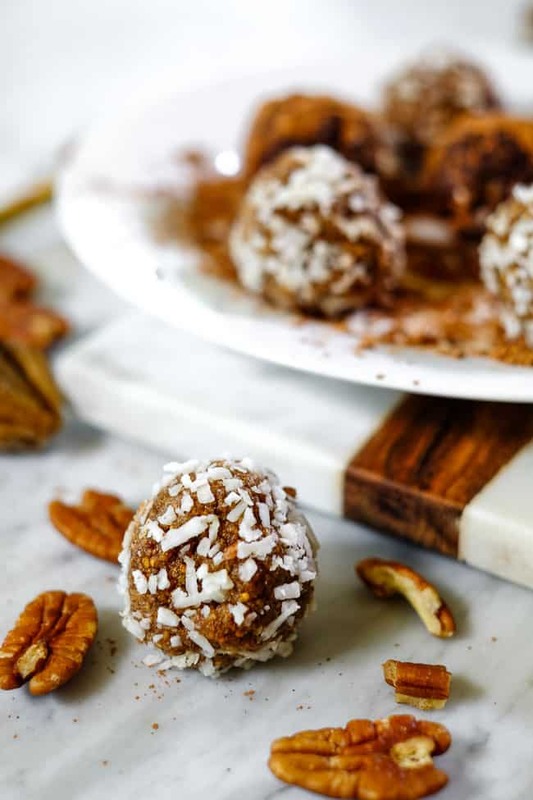 These Paleo + Whole30 fig and date bliss balls are a great grab-and-go snack you can meal prep and have on hand for healthy snacks during the week! Place all of the ingredients in a food processor. Process until ingredients are combined and they start to get clumpy. You may have to stop and scrape the sides down a couple of times. Once ingredients are combined, stop processor and remove the blade. Roll mixture into balls and place and then roll through optional toppings if desired.